Friday March 13- 1931 l finished my letter to Mrs Messer. did some washing. Mary took me for my treatment and brought me home. Read in evening. went to bed early Saturday March 14- 1931 I did ironing and other work. had letter from Laura wrote her and went up to library and bakery. Then wrote Elizabeth McCallister also letter from Will Work. and wrote him. 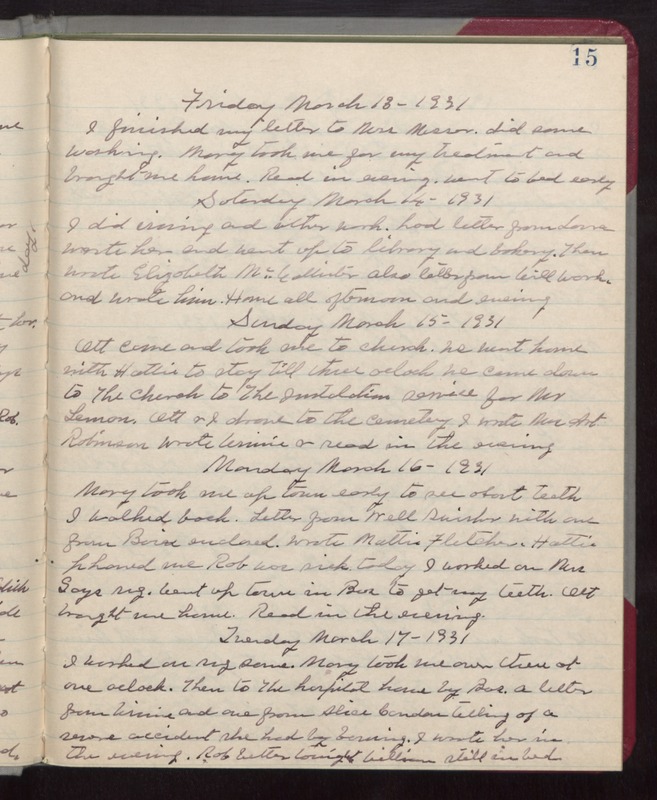 Home all afternoon and evening Sunday March 15- 1931 Ott came and took me to church. We went home with Hattie to stay till three oclock We came down to The church to The Instalation service for Mr Lemon. Ott & I drove to the cemetery I wrote Mrs Art Robinson Wrote Winnie & read in the evening Monday March 16- 1931 Mary took me up town early to see about teeth I walked back. Letter from Nell Swisher with one from Boise enclosed. Wrote Mattie Fletcher. Hattie phoned me Rob was sick today I worked on Mrs Gays rug. Went up town in Bus to get my teeth. Ott brought me home. Read in the evening. Tuesday March 17- 1931 I worked on rug some. Mary took me over there at one oclock. Then to the hospital home by Bus. a letter from Winnie and one from Alice Condon telling of a severe accident she had by burning. I wrote her in the evening. Rob better tonight William still in bed.